Have you struggled to cook thick pieces of fish, like halibut, thoroughly without totally drying them out? The key is cooking the halbut in parchment paper and making sure you properly fold the parchment. Many times I’ve come home with a beautiful piece of halibut, cooked it and found it either completely dried out or cooked very unevenly. The ends may be fine, but in the middle it’s suspiciously underdone. Not good. The key is cooking it in parchment paper. This provides both a poaching method and a steaming method to cook the fish completely without losing any moisture and drying out. And the beauty is that you can cook the vegetables right inside along with the fish. 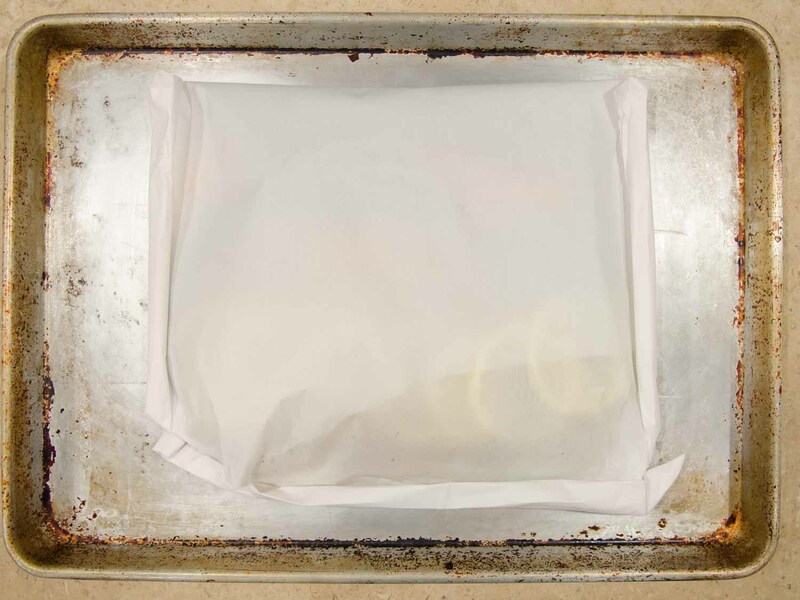 Start by laying out a sheet of parchment that’s twice as long as when you’re going to put inside. Place the halibut in the middle and the vegetables next to it. Lightly season with salt and pepper and drizzle Olive Oil inside, which will help to poach the fish. The mistake I always made was folding up the parchment like a tent and then doing some crazy roll-down in the middle. Wrong. 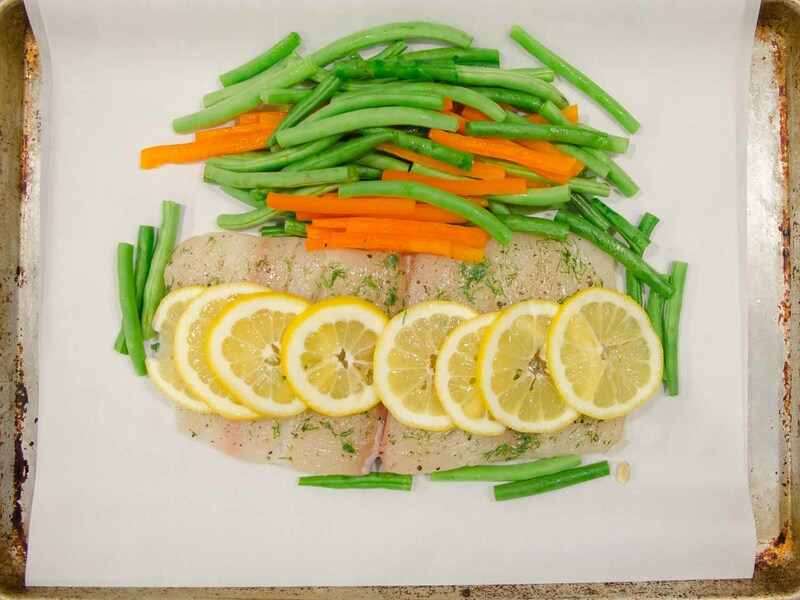 Fold the parchment paper over the halibut and vegetables, like a book. Leave about 3-4 inches around each edge. Make sure the packet is sealed all the way around so that 1) the oil doesn’t leak out and 2) the steam stays inside to cook the fish and vegetables. To give the fish and vegetables a charred finish, I place them back in the oven under the broiler. Now this can seriously dry the fish out, so if you do this, take the fish out 5 minutes before it’s done so that you finish the cooking under the broiler – not extending it. You can give the fish an even more exquisite, and flavorful, appearance by lightly brushing it with melted butter before broiling. The best melted butter will have garlic and herbs. In this case, I used parsley and dill. 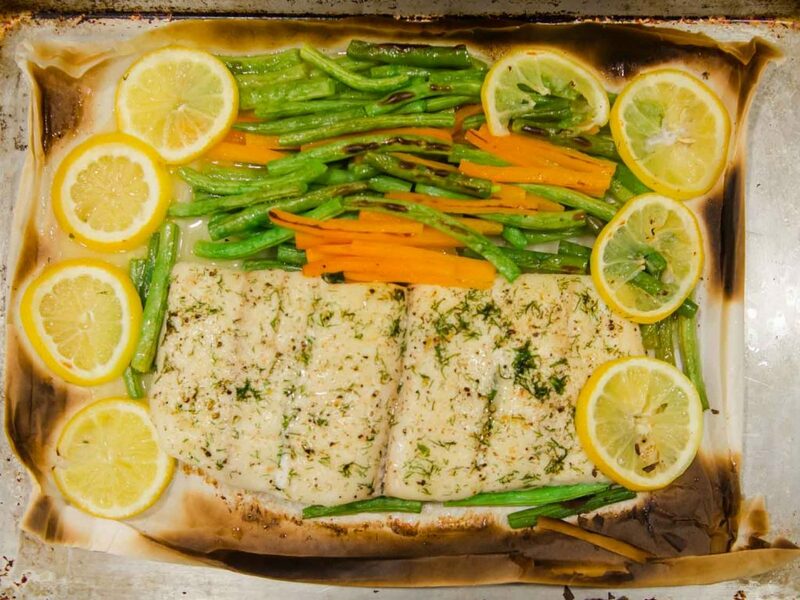 Give the fish, lemons and vegetables anywhere from 3-5 minutes under the broiler. Cook in the oven at 400 degrees for 20 minutes.